For many, the fireplace and chimney is the central focal point of a home. Whether it is a cozy gathering during the holidays with those you love or a romantic evening with that special someone, the fireplace provides more than warmth. Sweeping and cleaning the fireplace and chimney is an annual activity designed to protect your home environment and investment. Why should you have your chimney cleaned? Soot, caused by creosote, is a natural by-product of burning wood. Creosote is highly flammable and bakes and clings to the chimney walls and the buildup of creosote is the leading cause of chimney fires. The benefits of having your chimney cleaned and inspected include the reduced risk of a chimney fire, and breathing fresher air due to the removal of creosote during the cleaning. The inspection allows a homeowner to catch structural or water problems before they turn into dangerous issues that are expensive to remedy. Chimney sweeping and inspection should be done once a year to prevent fires and maintain your investment. 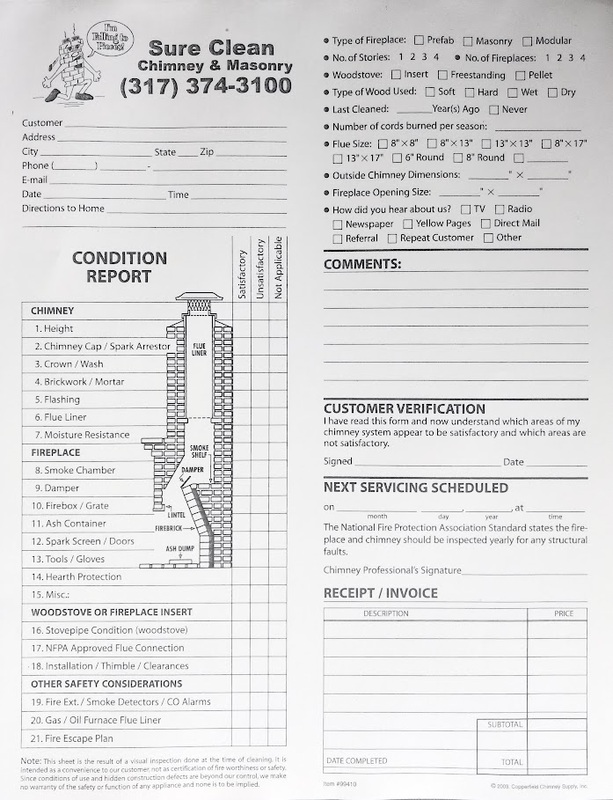 What does a chimney cleaning and inspection include? Sure Clean Chimney and Masonry started as fireplace and chimney cleaning and sweeping service. Our experienced chimney sweeps have cleaned well over 10,000 chimneys in over 22 years servicing the Indianapolis and surrounding area. We pride ourselves on exceptional customer service and satisfaction. Our sweeps are punctual, cordial, and equipped with the best tools and brushes ready to clean your chimney and inspect it. 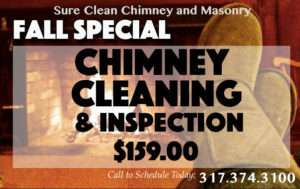 The process of cleaning your fireplace and chimney includes climbing on the roof, removing the chimney cap, sweeping the chimney from the top down, replacing the cap, vacuuming the creosote that has fallen from the brushing, vacuum and clean the firebox, check for validity of the firebrick and complete the inspection. This process takes about an hour and the homeowner will receive a completed condition report. One of the memories from my childhood that stands out is the evening we had a chimney fire. It was a frightening time. This fire could have been prevented with annual chimney cleaning. I know first hand the importance fireplace and chimney maintenance and I know the importance of having this service done correctly. Contact us to set up your cleaning and inspection today!